Malaga to London Heathrow (2 hrs 20 mins). Club Europe (business class) on a 13-year old A321. British Airways uses the main, central check in area at Malaga Airport, and had 4 counters open. Two were for Club Europe and two for Economy class, but queues were the same for each with absolutely no control exercised on who could use the Club Europe check in counters. All check in is conducted by their handling agents, and without a single member of BA staff by check in it appeared that nobody cared about the service standards or efficiency. The result was a waiting time of 30 mins for Club Europe check-in, whilst observing that about 70% of the customers in front were economy class (without any card / FFP benefits) and the Iberia handling staff could not care less. A very disappointing start to the trip and one that strips away any supposed benefits of paying for business class priority. Club Europe passengers can use the Fast Track security lane here at Malaga, and whilst this provided near instant service, it has to be noted that the main security leanes had queue times of just 3-4 minutes. Club Europe passengers have access to the Sala VIP lounge, located in the central airside area of the departure hall. A large featureless lounge, the majority of customers in here appeared to be pay-to-use passengers of various low cost airlines (easyjet etc). The downside is that having paid for their lounge access, the majority of these customers deem it necessary to see how much free alcohol, beer and wine they can drink in their 1 hour lounge stay and the end result is like a cheap drinking hole rather than a relaxing lounge. Boarding is a few minutes late due to late inbound flight arrival. Gate staff attempt to call forward customers in Group order, but pay no attention whatsoever to which group a customer is supposed to board. The other infuriating factor which always happens at Malaga is that the gate staff start boarding 5-10 minutes before the aircraft is ready, and flights always have all customers waiting aimlessly in the passage / airbridge for a long time. 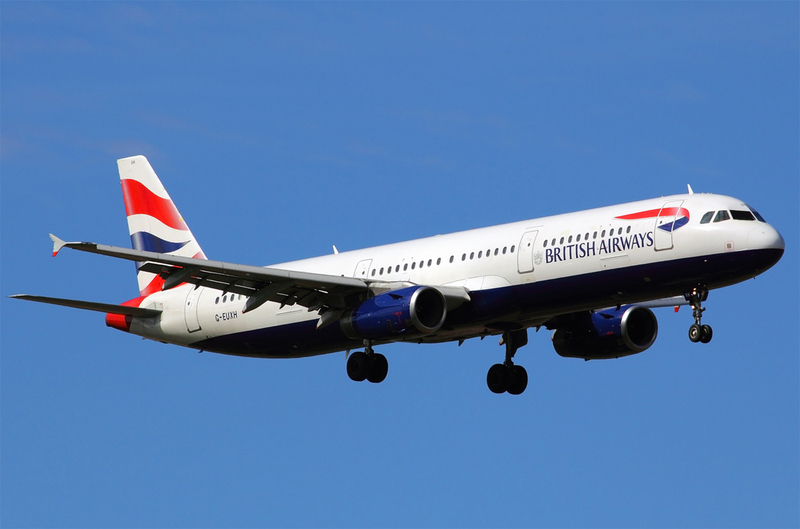 British Airways Club Europe offers a generous baggage allowance of 2 checked bags up to 32kg (70lb) each, 1 handbag/laptop bag plus an additional cabin bag. A continual issue noted again on this flight is that cabin staff exercise no control to prevent economy class customers stopping to store their carry-on bags in the business class lockers – 8 customers doing so was observed on this flight, and whilst a pedantic item to highlight, one imagines that BA may want to retain business class revenue by preventing such issues. The Club Europe seat is quite slim and whilst arranged 2×2 layout, this is on the basis that they are economy type seats with middle seat left empty and a drop down table. I was seated at Row 4, which I am convinced offers another inch or two of seat pitch. Comfort-wise, for such a short flight these seats are more than adequate and it is the empty middle seat that contributes to a reasonable feeling of space. There is no seat power or USB offered and British Airways does not provide onboard WiFi service across it’s short haul fleet. The cabin has a pleasant appearance of blues and greys and appearedreasonably clean. A single washroom is available at the front of the Club Europe cabin. The flight is nearly 30 minutes late departing, but with an over-generous flight schedule time our arrival into Heathrow was just 5 minutes late – the downside at Heathrow was being an off-ramp arrival and taking the bus to the terminal. The meal service comprises dinner for this 20.30 hrs departure, and is the new Club Europe meal service recently introduced by British Airways. Drinks are served from the bar cart before the meal service, a pack of almonds provided with this. There have been reports this new meal service constituted a downgrade by BA, but after careful study of the product served on today’s flight, I have to say that for this meal the “food quality” is slightly better than before. 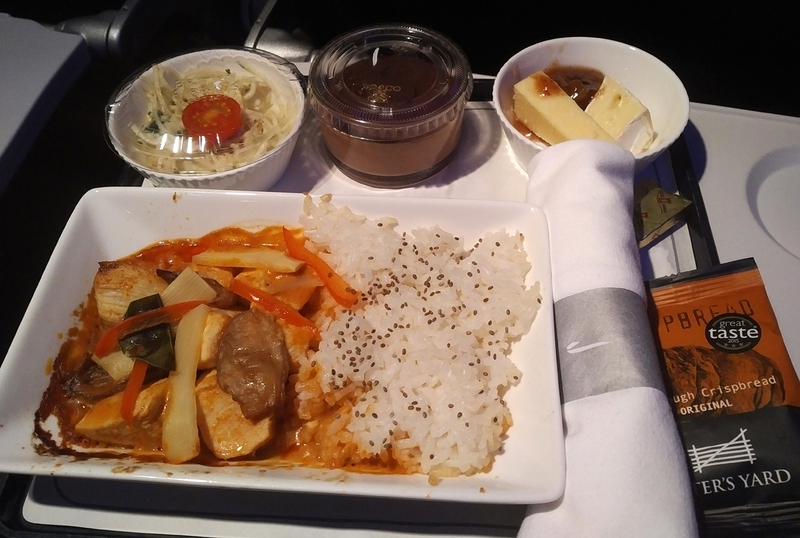 On a row by row basis, the cabin staff asked customers for their choice of entrée which comprised (1) a Thai chicken curry (2) ricotta and asparagus pasta or (3) coronation chicken salad. The staff return to the galley and add the entree selection before serving the tray to the customer. The dinner tray contained the entrée, a small celeriac salad with dressing, a cheese bowl of 1 cheddar / 1 x Camembert piece with mango chutney, 3 sourdough crispbreads, and a Do&Co chocolate dessert. Warmed breads were offered from a basket shortly after, with a choice of 3-4 types. The celeriac starter was tasty and portion size was reasonable (yes, this is a cost-cut from the former salmon appetiser!). The Thai chicken curry entrée was excellent, served with good quality breast meat, a flavoursome sauce and veg, and excellent rice accompaniment – this was a definite improvement on some previous Club Europe entree standards. The cheese was fine and accompanying mango chutney, although the sour dough crispbreads were brittle and lacking taste. Butter portions have been downgraded from the President brand to a Welsh brand, whilst the bread rolls were of a good standard. The new service concept does mean that breads are only offered once, whereas former Club Europe meal service normally had 2 services of the bread basket. The highlight of the meal was a Do&Co chocolate dessert which was superb in both taste and consistency. A second drink service was offered at the end of the meal, plus tea and coffee served direct from the galley. A polite enough welcome at boarding, reasonable attention to cabin safety factors, and the first point of contact in Club Europe is after take off when a small hot towel is served. This is followed by a bar cart service that was efficient and progressed quite quickly through this very large Club Europe cabin. The meal service format has now changed, and instead of a two-shot meal service previously (ie. appetiser removed when eaten and staff individually served the hot entree), the meal is now served as a single tray format including the hot entrée. Also, the menu card has gone and one assumes this is a cutback. The result on this very large Club Europe cabin (about 12-14 rows) was that customers in the back rows waited 1 hour longer to receive their meal compared to the front 2-3 rows, and this is simply not acceptable on a short haul flight. What was very noticeable is that cabin staff were rushed off their feet throughout this flight, and clearly found the new meal service to be very slow and cumbersome, having to constantly go back and forth to the galley – this exacerbated by a very large Club Europe cabin. This remains a strong point for British Airways with pilots being prompt to advise about flight delays, updates to arrival information etc. That said, the PA’s are only ever supplied in English language, whereas airlines such as Lufthansa, Air France, Iberia etc always manage dual language options. The same has to be said for cabin staff announcements, where BA seem to think that English language is the only language needed, despite operating flights across Europe. The aircraft was parked off-ramp which meant a bus to the terminal. This was allocated for Club Europe only, and once dropped at T5 entrance did result in only a short walk to Immigration. Baggage delivery was quite slow for a 10 pm arrival and quiet time at Heathrow T5, and after careful watching of the baggage carousel, Club Europe “priority” tagged bags were amongst some of the last to be delivered – another supposed Business class priority that BA ignores. A reasonably pleasant flight experience, but the “supposed” enhancements that are part of the business class package were noticeably absent – an unacceptable check in waiting time, no attempt to offer priority boarding, and complete disregard for priority baggage delivery. The new Club Europe meal service may not be an upgrade, but in realty the actual food standard was good, whilst the cabin service for this does not appear to have been well thought through and is far too slow and staff dialogue with customers is now almost zero.